Sand. Palm trees. Um... golden skyscrapers? The capital city of Qatar is undergoing a growth spurt of such epic proportions it's difficult to describe. Situated on a tiny out-cropping into the Gulf, just off Saudi Arabia, the country's open desert is being tamed, molded and transformed daily. Doha was one of those cities I never really thought I would visit, but as usual, life had other plans for me. When people ask what it's like, my standard answer is that is part baby Dubai, part construction site, with all the restaurants and brands you would expect to see in the west (particularly America). If you can drive for an hour without coming across a Starbucks or Baskin Robbins, a road diverted due to building works, or a skyscraper, please let me know. Visitors to the city seem to fall into two camps: they either complain about the heat (did I mention it's technically a desert? ), artificiality and air of materialism, or they marvel at the mix of cultures, architectural feats and what has been created in such a short space of time. I'm part of the latter group. A modern, safe, growing city that blends western comforts (H&M! IKEA! Air conditioning!) with Arabic culture and the tendrils of influence of millions of expats, who herald from countries ranging from Canada to the Philippines. You'll see traditional boats (called dhows) moored next to a parking lot smattered with Ferraris and things you've never heard of in the grocery section of Carrefour (what is a flat peach? Are those things next to the apples really banana tree stems?). It's an interesting place. 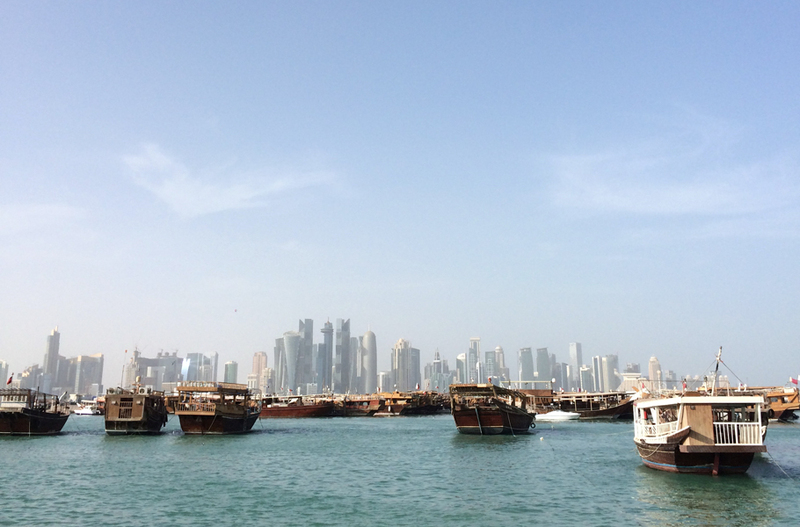 If you're researching holidays in Qatar, chances are two things will come up: the weather, and some of the more conservative expectations for visitors. The weather is a major factor if you're planning to go in summer and want to do anything outside. May - October is warm, but the real humidity kicks in around July and makes even the evenings sticky (avoid visiting in July, August or September if you can). Doha has adapted to the heat though: almost everything is air conditioned - all the shops, homes, offices and cars will be nice and cool. It varies, day by day - some days you want to climb into a freezer but others are mild enough to go for a walk in the evenings (yes, sometimes even in June). Because of the high daytime temperatures, many shops and attractions stay open quite late into the evening. While Qatar is an Islamic country and its laws are based on religious ones, they are more relaxed than some other countries in the region. You can buy alcohol at hotel bars and restaurants and there are fewer restrictions on clothing. For both men and women, the general rule is that your shoulders and knees should be covered in very public places like shopping malls, although shorter, tighter clothing is often spotted in more relaxed, semi-private spaces and fancy hotels. There are a few rules that you may not be used to (like avoiding over-the-top public displays of affection and insulting people) but these won't affect many tourists. One other thing to remember is that the work week is Sunday to Thursday in Qatar, like many other countries in the Middle East. Different rules apply if you're visiting during Ramadan, so make sure you check on opening times and only eat or drink in public before sunrise or after sunset, in solidarity with those fasting. Even though Arabic is the official language of Qatar, getting around as an English speaker is relatively easy. Most signage has both English and Arabic translations, and the vast majority of waiters, hotel staff, cashiers, shop assistants and other people you're likely to run into speak English. While there is a safe bus network that connects certain districts (the metro is currently under construction), the city isn't really pedestrian-friendly and it is easiest to travel around using taxis. Doha's drivers are notorious and the roads change regularly, so renting your own car and relying on GPS navigation is not recommended. Well, it depends. There are a few basic tourist attractions to consider depending on your interests. 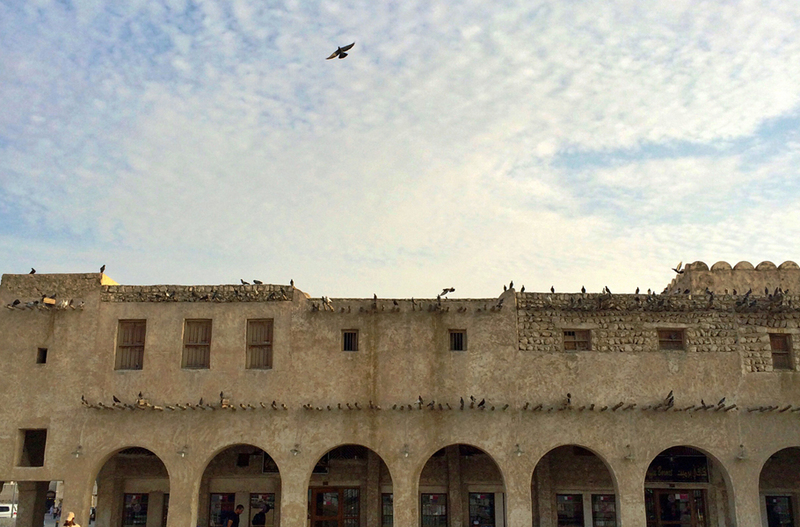 These include the Museum of Islamic Art (MIA), Souq Waqif, and Katara Cultural Village. The Doha bus is a good option if you want to squeeze them all in. But you should probably take some time to explore a few spots that your tour guide may not mention. Doha's promenade is popular with early morning runners and families taking a Saturday afternoon stroll. On one side, you have a busy but tree-lined street, on the other, you have the blue waters of the Gulf and bobbing dhows (as well as the occasional plane taking off or landing, given the proximity to the airport). At night, the dhows light up with vivacious coloured lights (I nicknamed them disco dhows because they look like they got lost on the way home from a rave) and the lights from the fantastical buildings across the water in West Bay reflect in the gentle waves around them. 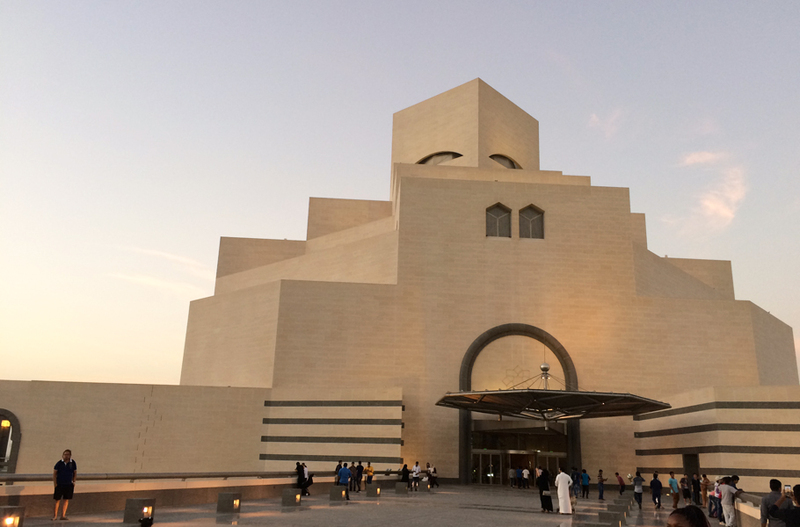 If you walk far enough along the corniche, you'll hit one of Doha's cultural landmarks: the Museum of Islamic Art. Architecture aside (seriously, wait til you see the entrance hall), the museum offers an impressive range of artwork, pottery and jewellery with a dose of history. Like most museums in Doha, entrance is free, unless there is a particular exhibition or event. If that's not your thing, the museum is surrounded by a beautiful park where you can sit under the trees, have a picnic and plot your next move. In the cooler months, it also hosts a Saturday afternoon market which features a range of locally produced and handmade food, art, clothing and gifts. This is one of Doha's biggest traditional-style markets -- and they sell everything from live bunny rabbits (I saw a toucan once) to beautiful Moroccan-style lanterns, electronics, spices, jewellery, clothing, the standard touristy fare (Persian carpet mouse pad, anyone?) and steely-gazed falcons (yes, really). There are also occasional musicians, as well as a mix of restaurants, from shisha cafes to those serving Iranian and Turkish cuisine. It's almost a bustling mini city in the evening, and an interesting place to wander around and hunt for curios to take home. If you're more into traditional shopping malls, you're in luck: the practically-named Mall of Qatar is the biggest in the country, followed by the new Doha Festival City. Others include West Bay's City Center mall, Gulf Mall (I love the traditional architecture of this one! ), and Landmark Mall. Villagio is the most interesting one (it's done up to look like Venice and you can take a gondola on a man-made canal inside the mall), Ezdan Mall has a nice mix of restaurants and fashion stores (including Magnolia Bakery, Pink Berry, Cotton On, etc) and Lagoona Mall is targeted mostly at shoppers looking for high-end designer brands. Don't know where to start? Try the two biggest ones. Otherwise, Ezdan, Gulf Mall and Landmark Mall are neighbours -- you can walk between Ezdan and Gulf, and Landmark is literally on the other side of the street. The sheer range of food on offer in Doha is staggering. There are about a million (fancy and expensive) restaurants nestled in every hotel, most of which host impressive Friday "brunches" (I use the quotation marks here because there is hardly ever any actual breakfast food and most start at noon, which is more like lunch in my books). Friday brunches in Qatar (and Dubai, for that matter) are all-you-can-eat institutions with live dessert stations, roving chefs, bottles of bubbly and food inspired by at least three different countries. One of the brunches I went to had a dessert room (yes, there is a room in Doha that is filled to the brim with chocolate fountains, macarons, cakes and pastries every Friday) and another had a pasta station where the Italian chef made my gnocchi from scratch while I blinked in surprise. These brunches are expensive and a bit over the top (depending on how important food is to you) but they're still an experience. If you're curious, Sridan at the Shangri La has great vegetarian-friendly options, and the Four Seasons is the one with a dessert room. If you wander off the hotel circuit a bit, there are even more places to make your skinny jeans stretch. I've rounded up a few of my favourites in the "Where to eat" section below. One of the more interesting spots to visit lies just outside of Doha. The Sheikh Faisal Museum (that's Sheikh Faisal Bin Qassim Al-Thani Museum to you) is a labyrinth of the ancient, rare, treasured and strange, collected by the Sheikh over the years. His collection includes items as varied as a traditional bedouin tent, vintage cars, Michael Schumacher's signed Formula 1 racing suit, a penny farthing or three, Greek pottery, an aeroplane, match boxes and old credit cards. Oh, and an entire house brought over brick-by-brick from Syria, and enough cars to fill the parking lot at your local mall. Everything is grouped in a vague sequence, but there are very few signs or explanations about what exactly you're looking at, so it's best to secure a guide. The museum charges a small fee to visitors, and it's best to book in advance on the website so they know you're coming. Okay, so the fantastical buildings are getting a bit much? There are a few day tours you can take to get out of the city. Desert or dune-bashing safaris to Khor Al Adaid are popular (they can fetch you in town and take you out to more remote areas of Qatar) and often come coupled with opportunities for sand boarding, camel-riding or a bedouin-style meal near the "inland sea" that separates Qatar from Saudi Arabia. While dune-bashing (riding up and down sand dunes, usually at speed) is a popular weekend activity for Qatar residents and anyone with a 4x4 seems to want to try it, there have been very serious accidents out in the desert. If it's something you want to do, make sure you go with an experienced driver (from a reputable tour company) who knows the dunes well, and speak up if the ride is getting too wild for you. If you're more into fossils than sliding down sand dunes, you can visit Qatar's first (and so far, only) UNESCO World Heritage Site in Al Zubarah. Situated in the north of the country, the Al Zubarah fort and archaeological site is a bit of a drive (an hour or so) from Doha, but it offers interesting insight into Qatar's history of pearl diving and nomadic tribes through a small, interactive museum near the active dig site. If you want to see some of the desert's natural wonders, consider a tour to Qatar's western Zekreet peninsula. This area is home to amazing "desert mushrooms" - stark cliffs which have been carved by the wind. This is where you'll find Richard Serra's East-West / West-East sculptures, a nature reserve with local wildlife like oryx and desert foxes, as well as an abandoned film set of a Qatari village that is great to explore. Qanat Quartier: This gorgeous Venetian-inspired suburb on The Pearl Qatar (a man-made island) is a pastel paradise. The Corniche: This seaside promenade is probably where most of the images the world sees of Doha are taken... and for a good reason. Falafel: These balls of fried chickpeas or fava beans are a beloved and cheap vegan sandwich filling. Pick up a homemade wrap from stalls at Souq Waqif or grab one on the go at Zatar w Zeit or a range of local restaurants. Karak: This delicious sweet chai tea is a local favourite, sold at corner shops and cafes alike. Try some at Chapati & Karak at Katara, Karaki at The Pearl or at chains like Tea Time. Dates: One of the few fruits that grows happily in the desert, you'll see varieties of dates you've never imagined in Doha. Try them all, or take a box home as a souvenir. For local and regional cuisine: Gad is an affordable Egyptian restaurant which makes (in my opinion) the best falafel in Doha. If you're not up for venturing out into the suburbs, Zatar w Zeit is an easy and affordable option for Lebanese food with shops across the city, while Souq Waqif's The Village and Al Terrace are delicious dinner spots with great ambiance. If you're up for a bit of a drive, E'asair Café at the souq in the town of Wakra (around 20 minutes drive south of the airport) serves excellent Qatari food in a restaurant with gorgeous décor and tables overlooking the beach. Qatar's first vegan café: Evergreen Organics, a plant-based, all organic restaurant situated on a man-made island, may just be my favourite restaurant in Doha. Their incredibly inventive and ever-changing menu is borderline addictive... try the sweet potato french toast, buckwheat pancakes, or the delicious "baddest burger" and you'll see what I mean. If you need somewhere with good coffee and free wifi, Flat White makes some of the best brews in the country, while Meesh Café is a digital nomad's paradise with food, laptop-friendly tables and power outlets everywhere. Spots closer to West Bay include Bread and Bagels (try the portobello mushroom burger while you're there) and chains like Caribou Coffee and Starbucks in City Centre Mall. On the sweet side, Doha delivers with scores of sugary options. If you're craving something sweet, the dessert menu at Sugar and Spice is pretty incredible - it's an adorable little tea shop that is very popular with locals, so you may have to book a table ahead of time or join a waiting list. If you're looking for an exquisite meal, La Varenne in Tornado Tower is a great choice for French cuisine (especially once the sun sets and you see that city view) and Spice Market is one of the top South East Asian restaurants in the country with a range of vegetarian options and interesting flavour combinations. Visiting in the warmer months? What you wear makes a big difference. Opt for loose-fitting clothing in natural fabrics like linen and cotton, and sandals instead of closed shoes. If you want to rent a car, be careful following your GPS blindly - there is so much construction that the apps can't keep up. Try crowd-sourced ones like Waze, which are edited by locals and usually have the newest road closures. Most shops and restaurants close over lunch time (usually 11:30 - 13:30) for prayers on Fridays, so schedule your activities for earlier in the morning or later in the afternoon. Have you been to Doha? What would you recommend as a must-see for new visitors? Let me know in the comments! Visiting in the cooler months? Here are some tips on what to do in the spring time.